Samsung has gone ahead and launched the Sprint AIRAVE compact femtocell base station in the two US cities of Denver and Indianapolis. Sprint’s AIRAVE device provides enhanced in-home wireless coverage plus unlimited calling facilities. 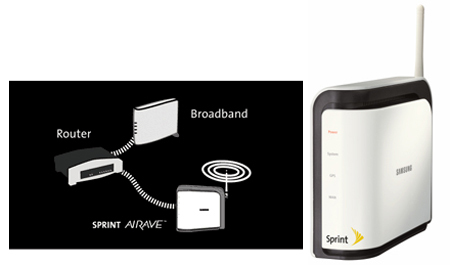 The Sprint AIRAVE device can be used with any Sprint phone and a broadband Internet connection. Take advantage of enhanced coverage and unlimited home calling without having to purchase a new phone. All Sprint phones are compatible with AIRAVE. Users can reduce their monthly communication expenses as the AIRAVE service is priced at just $15 per month for individuals and $30 per month for families, in addition to the customer’s regular wireless voice plan. Samsung has confirmed that Sprint customers in select areas of Denver and Indianapolis will be able to immediately purchase the AIRAVE device at Sprint stores for just $49.99. Launches in other US cities are expected to follow soon.